A perfect modern house decoration style is involving all the types of articles, even an alarm clock. 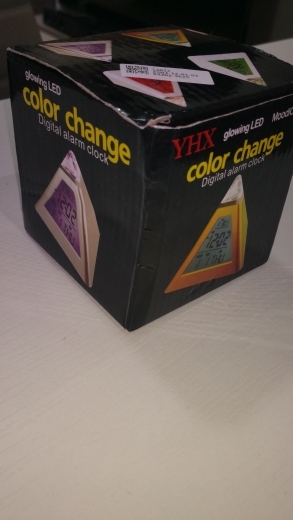 This digital pyramid clock with LED backlight will undoubtedly satisfy your anticipation. The multifunctional design allows it to not only provide accurate time and wake you up on time, but also offer snooze setting, night mode and indoor temperature. - Material: ABS and electronic components. - Size: Approx. 10 x 10 x 10.5cm/ 3.94 x 3.94 x 4.13 inch (LxWxH). - Built-in 7 color LEDs to change the light color automatically. - With music alarm and snooze functions, suitable for person with difficulty in waking up. 8 songs for choice. - Night light allows you to read the time clearly in the night without glare. - Can display the indoor temperature in Celsius or Fahrenheit degree. - Great choice for home furnishing. This unique eye-catching exquisite pyramid clock will bring a modern touch to the house. - Fashionable, creative and practical. Perfect as a gift for family and friends. - Powered by 3pcs AAA batteries (not included).